Such a great touch on any male :) Adds class and confidence. Great post! Yes it’s a lovely couple of photos. I like the left one though, because the man looks to be so intently listening to his conversation partner, and the body language is so friendly and respectful. It’s really cool and makes the differnce on a boring look! I love love love the red one! It evokes an Indian vibe to me…. I definitely prefer the blue one, I think the quality stands out. They seem so cosy! I like the blue on blue, but shawl are often quite colourful in the first place… so only two shots? Definitely a fan of the blue! Love colorful shawls, always look stylish! Love the colours!! I think i prefer the red one! I really like that scarfs too and I wore it too. Have a nice day. I love it! It looks like the man in blue planned his outfit carefully. The man in red looks a little more like he woke up and got dressed but didn’t take as much time as the other man. The shawl works equally well on both of them. It’s a classy way of saying, “I’m running out the door but it’s cold.” Great colors, too. Agreed! Men and a shawl…and colorful too. The guy will be warm and styling walking down the street during the cold weather. Come’on man, they look ridiculous. Don’t try to look like a woman. That’s the first rule. Agreed. This has to be the worst attempt at style ever. Yes. They are trying so hard to look different. Love it, the guy with the velvet suit is dressed amazingly. I’m not so sure but it could be more appropriate for a woman outfit…..
Firs is more effortless. Second is more chic! Who knew a simple scarf or a shawl can be so versatile! It adds a lot of drama especially when it’s worn by guys. Not feeling it. I’m a big fan of scarves, even women’s scarves on a guy (I’ve been known to wear one or two of my wife’s on occasion), but the shawl thing looks silly here. These are great! I love a scarf on a guy. love the scarfs wonderful…and her bag….the man on the left has so many wrinkles but he still has his hair!! perfect way to spice up any look, and also to stay warm! All these “blues” and the different textures look so good together. (I love the velvet jacket). Crazy. Not a good kind of crazy. No. A but too over-the-top and theatrical for my taste. I like men to be stylish, yet understated in their fashion. That’s my personal preference. I love the fact that they both suit the color they’re wearing perfectly! SO love this look on a man! Effortless way to add distinction and style. Hoping you get enough pics for a ‘If you’re thinking of…. ‘ feature! Men walking around with a blankets draped around their necks looks ridiculous. It may work in Paris, but not Ottumwa, Iowa. Face it, Paris is just one big fashion biosphere that the rest of the world can chuckle at. I love this trend! I can’t live without a pashmina!!!! I love both red and blue. I like it. I want to buy this red one. I love the colorful and big scarfs!! It depends on how you wear it. I like the first photo’s outfit, not the second, for some reason. Yes, yes, yes. Love, love, love it so much. Unfortunately most men shy away from strong colours and big scarfs. So come on men, break the rules! I love long long scarfs.i love shawls for men and women.Put colors in your live! 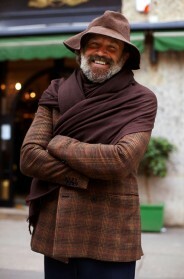 Lovely, I adore men with shawls! It hardly looks like either one of those men are trying to dress like a woman! It’s a big scarf – and they both look great! The left picture I can handle; the right one is overdone and a turn-off in my opinion. However, I do love that shade of blue. I thought this post was sarcastic; “If You’re Thinking ….. About a Colorful Shawl” Don’t …. Please – this does not look good! Men and shawls….I think it looks dorky on men. At least here in the U.S. Maybe in Europe men can pull the look off and still look masculine. In the U.S., men just look like they’re cold and they’re a member of Occupy Wall Street. Women can pull off the Shawl Look gracefully and with great style. Too much fabric! Too distracting! If all you’re going to see is the shawl, then use some patterns instead of one big solid color. Yes, really love this Post! Theese two man look amazing! I HAVE been thinking about shawls. This leads me away from that notion. The way that the blue one is tied around the neck yet leaves chest exposed throws away any pretense of practicality and warmth; it is purely for style in a more traditionally feminine way. The red one on left is also a bit overpowering– almost like the shawl is wearing him. Almost–because he exudes joie de vivre. Does anyone know where I can purchase this wonderful scarf/shawl? I’m thinking about shawls and scarves all the time. Great looks. Shawls give an extra touch!!! aren’t those shawls too long? i think so! 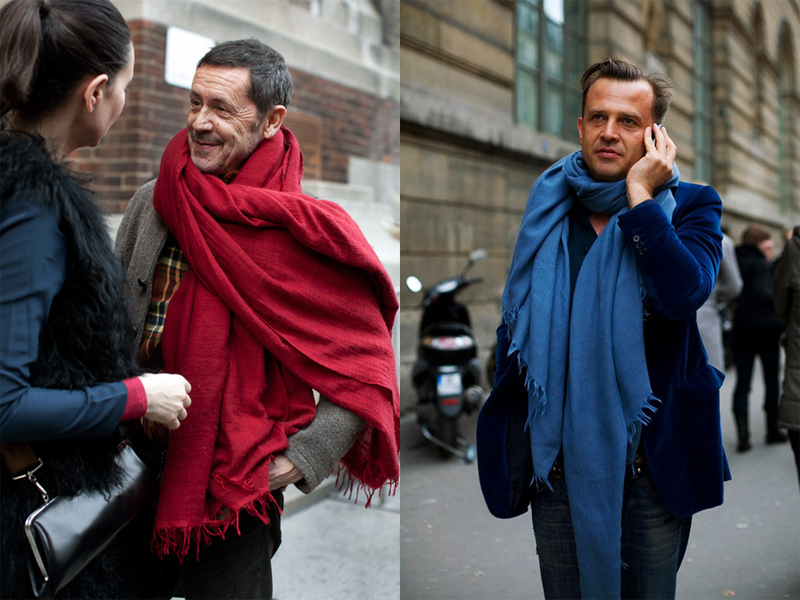 The blue scarf is lovely and style-y, but the fellow with the red looks like he has a blanket wrapped around his neck. what shop would you recommend I get one of these in? A few weeks ago anyway Odin (199 Lafayette Street) had some. I couldn’t tell if I liked it or not, but I have decided that; YES. It plays. Especially combined with the confidence of these two men. No, no, and no! ;-) By the way: Which real existing person would walk around with such an monstrous Shawls on his neck??? I can’t say I’m a big fan of the look. If a guy wants to wrap himself in something larger than a regular scarf there are traditional male garments that could use an urban revival: capes, ponchos, sarapes, etc; maybe even togas :-) . I sometimes wear a sarape at home on chilly mornings. I think part of it is that they’re wearing it like a scarf around the neck rather than around the shoulders and/or wrapped around the arms and it kind of overwhelms them. All that said, they’re nice shawls and they look like confident guys. I do like the colors and what the two men seem to be wearing underneath. I suppose it looks better in person and real life they carry it of really well. Everything is not “amazing”. Sometimes it’s just too much. Is a Bozo tie better than a nice four-in-hand? Things that are different are not necesarily stylish. Call it Lohi. It is a great thing to wear for Fall/Winter/Spring. The man in the red is wearing it better than the guy in the blue. It is not supposed to be fashion, it is supposed to be an accesory, and they should be worn for a practical reson. And yes, these garment will be widely used in the future. * And yes women love it, great way to comfort them on a chill evening. My old partner lent me a pink one that I wore with my blue seersucker for a weekend flight to Miami. As a six foot black guy, it really helped me cut a dashing figure!